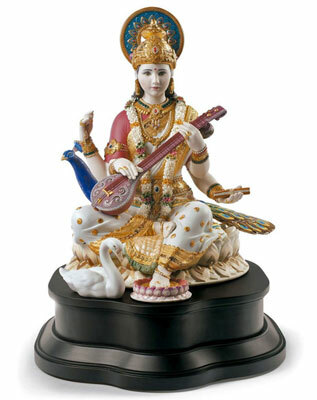 We have just got word that Lladro’s newest Hindu Masterpiece Saraswati 01001978 has been completed and should begin shipping out to authorized Lladro dealers in September. This highly detailed limited edition has been in development for over three years and is sure to sell out extremely fast. With only 720 pieces made worldwide, only a small number will ever reach the United States. This is the third High Porcelain Hindu Deity release along with Ganesha and Lakshmi. Both sold out very quickly and have increased in price dramatically on the secondary market. If you are interested in the Lladro Saraswati 01001978 don’t delay, because it is sure to be very sought after! Want to see a Lladro artisan paint a sculpture right before your eyes? 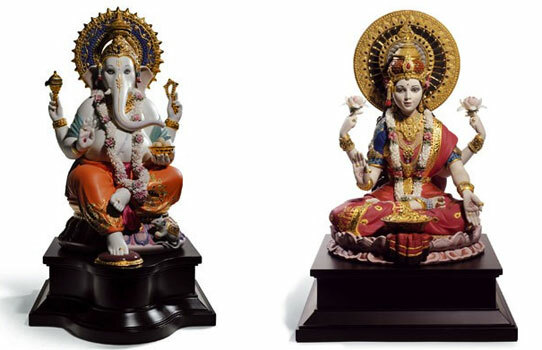 Both the Goddess Lakshmi and the Lord Ganesha shown are sold out editions. They were High Porcelain editions that were highly limited. Lakshmi’s last retail price before selling out was $10,000. We expect the latest Lladro limited edition in this series, the $24,900 Lord Balaji to sell out quickly also. It is only limited to 299. Lladro does have a smaller 8″ Lakshmi available for $1,350. Lladro also makes a 9″ Ganesha that sells for $1,170. They also have a different limited edition Ganesha available for $6,240.